The SCA has an elaborate system of rank, awards, and honors, which are granted to individual members in recognition of service, achievement, excellence, good deeds, or for many other reasons. 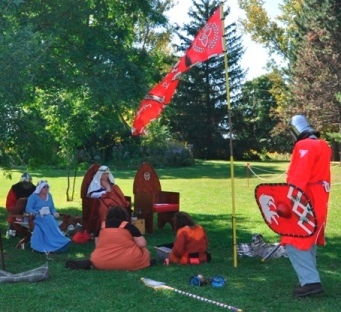 Everyone is presumed to be minor nobility to start, but any noble titles or honors must be earned in the SCA. The bestowal of honours could not be done without the recommendations of the people. You can and should recommend anyone whom you feel is deserving of recognition. Check what awards the person in question may already have by viewing the Kingdom Order of Precedence or the Vest Yorvik Order of Precedence. Check the criteria for the various awards and honours. Make a recommendation to their Majesties (names and contact information are on the Ealdormere web site). The Canton has three awards, any of which a person can receive more than once. Jessica's Cup: for Arts and Sciences, this award is given yearly by vote of Canton members at the Christmas party. The award is a silver cup, passed on each year to the new recipient. The Golden Goth: for making us laugh, this award is also given by vote at the Christmas party. The award is a plastic statue, passed on to the new recipient. Gawain's Arrow: for service to the Canton. Anyone can make a recommendation to the Canton officers. The award can take any form that displays an arrow and is usually crafted by a Canton member as a gift to the recipient. The Canton Order of Precedence (in PDF format) lists the awards Canton members have received and the "precedence" (sequence of rank) this grants them within the Society. For changes or updates please contact the Canton Pursuivant.